Merry Christmas lovelies! 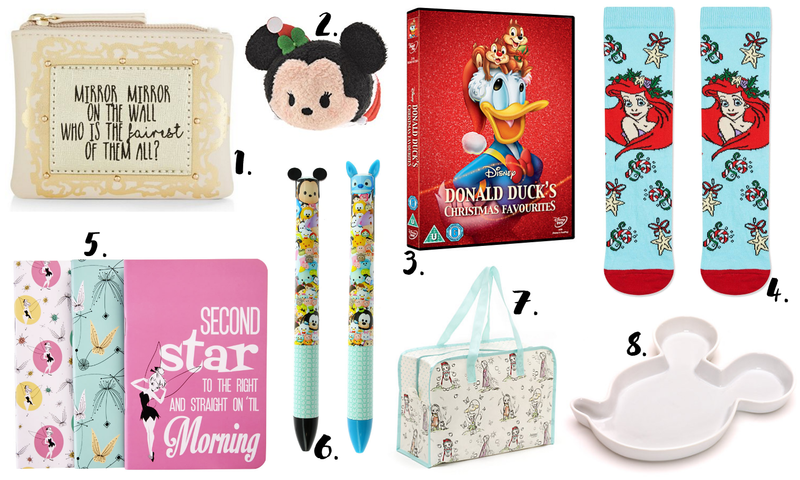 For today's Blogmas post I thought I'd share some Disney bits I've found on the internet recently which would be perfect as Secret Santa gifts or stocking fillers. They're all £5 or under so hopefully there should be something here to suit everyone's budgets! New Look always have the cutest purse designs and this one is no exception! If I didn't already have two of their Disney-inspired designs I'd definitely be treating myself to this one! I also think the cover of the Donald Duck's Christmas Favourites DVD is so lovely - it reminds me of the beautiful covers on the classic collection of DVDs. It would make such a lovely gift for any Disney fan. And I'm very tempted to buy the Mickey Mouse snack bowl from the Disney Store for myself! They come in a range of colours and while it's meant for snacks, I actually think it would actually make a lovely jewellery dish! I hope this was helpful for you guys! I'm taking part in a Disney Secret Santa myself so I might have to make use of this post myself for my gifts!